British women have tottered their way to the top by wearing the highest heels in Europe, with the average heel height at 3.3 inches. Some take it to even greater heights, with a quarter of British women surveyed (25%) wearing heels 4-6inches high and a skyscraping 3% braving heels that are more than 6 inches. 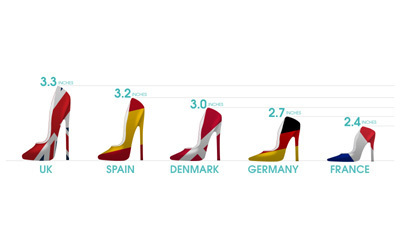 In comparison, Spanish women wear an average 3.2 inch heel, Denmark 3 inches, Germany 2.7 inches and France 2.4 inches. The European survey, by the makers of Compeed polled 3,792 women from 5 countries (France, Germany, Spain, Denmark and polled 1,000 from the UK alone) and suggests that the shorter the woman, the higher the heel. Perhaps it's no surprise then that British women are among the shortest in Europe with the average height of an 18 to 29 year old standing at 163cm. In comparison, German women are the tallest in Europe at 168cm and younger Spanish women are just one centimetre taller than British women. Within the UK, women from the North East give a whole new meaning to the term 'Northern Swagger' by towering above us all in the highest of heels (3.46 inches). 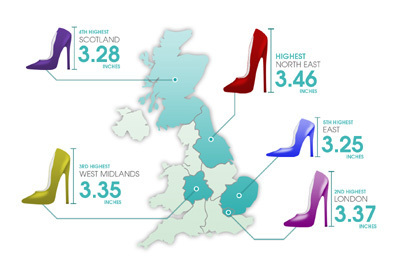 Londoners stride into second place with an average heel height of 3.37 inches; women from the West Midlands are a few stiletto steps behind at 3.35 inches, while the Scots and women of Eastern England prefer a more conservative height of 3.28 and 3.25 inches respectively. Psychologist, Emma Kenny explains: "Research has suggested that a tall woman is considered more assertive, confident, richer, capable, successful, independent and even more intelligent than their shorter peers. Perception is incredibly powerful and it makes sense that the feedback we receive from the way we are treated by others will reinforce our choices. The British woman is an ambitious breed, and if putting on a pair of six inch heels increases their career prospects, rightly or wrongly, the savvy individual will do so". Sandra Chatelain, spokesperson for Compeed says "The research shows that heel height for many comes at a price, with 65% of UK women citing blisters as a significant source of pain resulting from wearing high heels. Despite this, 1 in 2 women (50%) are prepared to endure a level of pain they ranked as comparable with toothache and earache. We at Compeed know that ladies love to wear high heels and as long as we take appropriate measures to protect our feet, British women should continue to be unstoppable, keep calm and carry on". Lorraine Jones, member of the Society of Chiropodists and Podiatrists says "As a podiatrist I recognise that with fashion as it is, wearing foot-friendly shoes is not always easy. However, wearing fashionable shoes occasionally is fine, and here are plenty of easy foot care treatments available at the local pharmacy that can help treat feet at home and avoid a trip to the podiatrist's clinic. The bonus is that with healthy feet, a woman can stand as tall as she wants in the highest of heels". For more information on the Compeed range, visit compeed.co.uk.